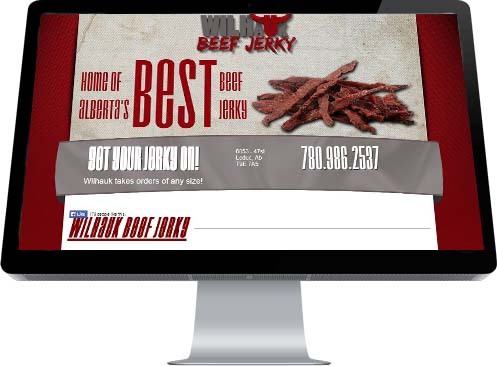 When Trent Wilhauk approached Industrial NetMedia to develop a website for his company, Leduc Meat Packers, his goal was clear. He wanted to promote the fact his company produces the best-tasting beef jerky to be found on the planet. Although, like many meat packers, Trent's business sold various cuts of meat, ready-to-cook hamburger patties and a tantalizing array of pepperoni, their main claim to fame was the jerky that has achieved almost cult status in popularity. With this mandate, Industrial NetMedia staff designed a splashy, vibrant Home Page that left no question as to what the company's most valuable product was. Additionally, they included a separate page discussing only the jerky so fans to find out more about the product they love so much. Another page was added to showcase all the other well-loved items in the meat packer's inventory, including their delicately smoked and spiced garlic sausage, ham sausage, and smokies, as well as pork or beef breakfast sausages. Given that Leduc Meat Packers has been an iconic feature of the Leduc business landscape for half a century, it was obvious a page outlining the company's rich history should also be developed. A detail and data-heavy contact page including location information, hours of operation, and contact form for pro-active lead-capture capability.